It’s October and that means it’s time to celebrate pumpkin and it’s almost time to celebrate my birthday. 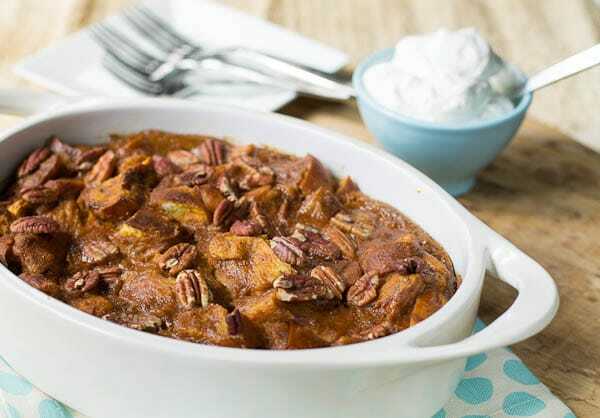 🙂 Fall of course is all about comfort foods and is there anything more comforting than a warm, rich bread pudding? I know some people don’t like bread pudding and to tell you the truth, I was one of those people until a few years ago. But now I love it and can’t get enough of it. 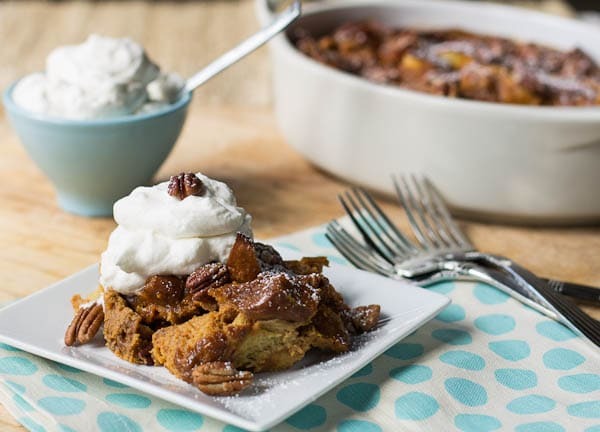 If you love the flavor of pumpkin desserts, but aren’t sure you like bread pudding (I mean it is soggy bread after all. It can take some warming up to. ), this is the perfect recipe to get you to fall in love with bread pudding. 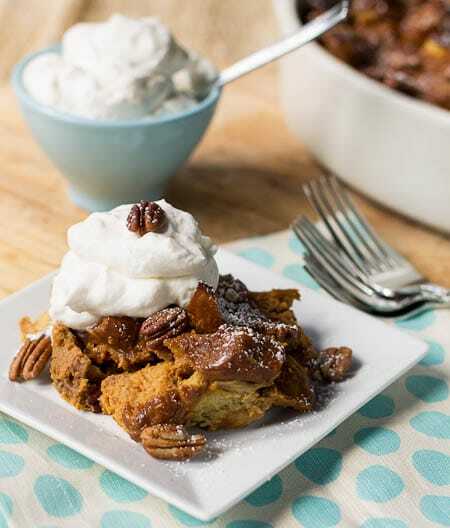 This recipe for Pumpkin Bread Pudding was in the November/December 2013 issue of Fine Cooking Magazine. The one with the too-die-for Bourbon-Caramel Pumpkin Tart on the cover. I saw that gorgeous tart and thought I have to make that ASAP. But that recipe looks so involved and complicated. And truth be known, I sometimes feel a little lazy this time of year when the weather starts to change. I just wanted something easy and forgiving and bread pudding is both of those things. I changed the recipe a little, basically cutting the quantity of most ingredients by one-third because god knows I didn’t have 12 people to serve it to and I was worried I would have eaten 9 of those servings. I also topped it with some pecans. As a child we would go pecan picking at our grandparents house every fall and I have to resist the urge to add them to everything this time of year. Instead of serving it with ice cream which I usually do with bread pudding, I whipped up some cream to which I added a little bourbon and maple syrup. The end result was delicious and I’m thinking it’s totally worthy of a place on the Thanksgiving buffet. 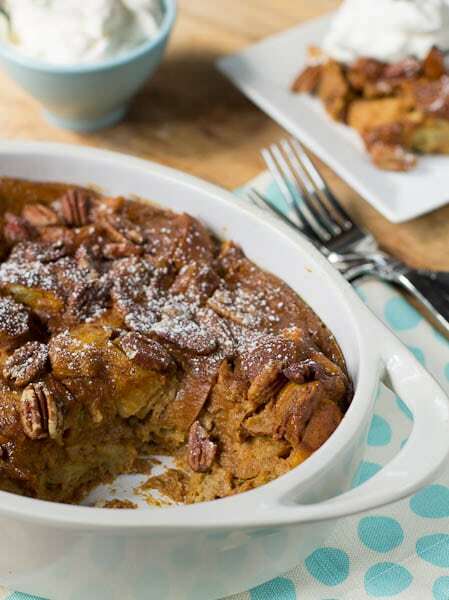 And if you’re looking for more bread pudding recipes try Cinnamon Roll Bread Pudding (for breakfast or dessert!) or Blueberry White Chocolate Bread Pudding with Amaretto Cream. PS-If you made the Bourbon-Caramel Pumpkin Tart on the cover of Fine Cooking, let me know how it turned out. 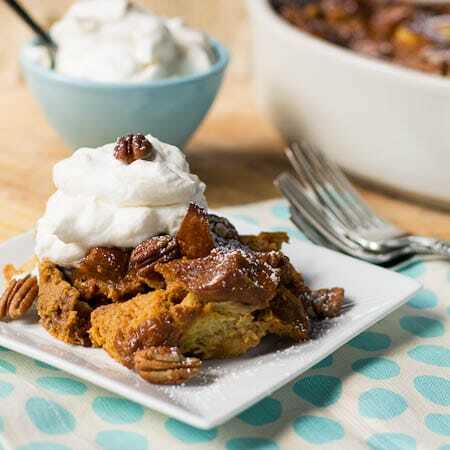 A rich pumpkin bread pudding deliciously flavored with dark brown sugar and fall spices and topped with pecans. Serve it warm with bourbon-spiked whipped cream for a memorable cool-weather dessert. Place rack in center of oven and heat oven to 350 degrees. Butter a 9X13-inch or slightly smaller baking dish. In a large bowl, whisk together the pumpkin, milk, cream, brown sugar, eggs, vanilla, cinnamon, ginger, nutmeg, salt, and cloves until blended well. Fold in bread cubes and let sit at room temperature for 15 minutes. Stir pumpkin/bread mixture and pour into prepared dish. Sprinkle pecans on top. Bake for 40 minutes or until skewer inserted in center comes out clean. Let cool for 20 minutes before serving. To make cream, beat whipping cream using electric mixer with whisk attachment until soft peaks form. Continue to beat while adding in the confectioners' sugar. Once stiff peaks start to form, beat in bourbon and maple syrup and turn mixer off. When whipping cream, it helps if the beater and bowl are cold. Put them in the refrigerator before hand to chill. 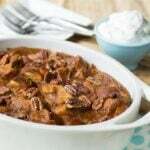 This entry was posted in Desserts and tagged bread pudding, pumpkin, southern desserts. Bookmark the permalink. My husband adores bread pudding so I definitely have to make this for him. I’m like you and not really into bread pudding but this looks so good that you may have converted me! If you make it, I hope you enjoy it Tina! Have a great weekend! This is totally for me!! Love pumpkin, but not sure about bread pudding! Mmm, looks yummy! Omg! SO funny.. I bought that issue of Fine Cooking last week and got all the ingredients but I can’tsseem to find Brioche or Challah bread in any local grocery stores! Grrrr.. I’ll have to find a bakery… Super excited to make this tho! I was lucky to find some Brioche at my local store (Harris Teeter) but I typically have trouble finding Brioche and Challah too. And it was by no means good quality, fresh bread, but luckily that doesn’t matter for bread pudding. Hope you enjoy it as much as I did! This sounds so perfect for fall! I used to not like bread pudding either – but within the last year or two I’ve really started to enjoy it. Love that bourbon whipped cream! Thanks Ashley! Isn’t it funny how your tastes can change? I like so many more foods than I did years ago, but luckily I haven’t turned against any that I’ve liked for a long time! Wow! This looks delicious! What a great flavor combination. Thanks so much Erin! Can’t go wrong with pumpkin 🙂 Have a great weekend! It can be hard to find and some stores seem to carry it only around Thanksgiving time. I shop at 2 stores in my town and one of them has it and the other one only has the pumpkin pie filling. I usually find it in the baking aisle right next to the pumpkin pie filling. Good luck finding it and stock up when you do :). At least it keeps a long time! I’m definitely one of those people who LOVE bread pudding. I can’t believe it’s been so long since I last made it… that should change as soon as possible! This looks amazing, and all those pecans are a lovely addition! And the whipped cream on top sounds wonderful too. Happy almost birthday! I love bread pudding. We served a chocolate one at my wedding. Pumpkin is such a good addition!!! Thanks for the early birthday wishes Amy! That is so cool that you served bread pudding at your wedding! Oh my, does this ever look good, Christin! I don’t normally eat/make bread pudding, but I can tell you right now if this were in front of me, I would eat it! I can’t deny any pumpkin desserts, and the pecans and bourbon can only make it better. Can’t wait to see what good you make to celebrate your birthday! I’m hoping I can get my daughter in the kitchen for my birthday. I just love when she cooks with me! Looks amazing! Bourbon in bread pudding? You can’t go wrong there. Delicious Christin! Thank you Anne! You’re right, there’s no going wrong with bourbon and bread pudding. GET OUT OF TOWN!!! Dying. Literally, dying. Duuuuuuude! It’s like you put all of my favorite things in one dessert. I’m smitten.